We’d love your help. 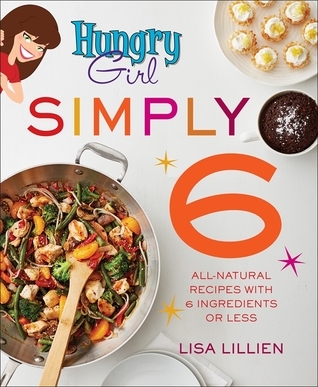 Let us know what’s wrong with this preview of Hungry Girl Simply 6 by Lisa Lillien. People everywhere are craving super-simple recipes with short ingredient lists, and Hungry Girl has come to their rescue with Hungry Girl Simply 6: All-Natural Recipes with 6 Ingredients or Less! For the first time ever, chapters are organized Thanks to #1 New York Times bestselling author Lisa Lillien, eating healthy, delicious & satisfying foods has NEVER been easier! 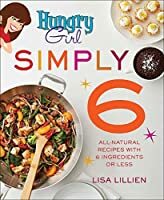 People everywhere are craving super-simple recipes with short ingredient lists, and Hungry Girl has come to their rescue with Hungry Girl Simply 6: All-Natural Recipes with 6 Ingredients or Less! For the first time ever, chapters are organized by main ingredient—like CHICKEN, VEGGIES, EGGS, OATS—making it easy to find EXACTLY what you need. Featuring familiar ingredients and just a few simple steps, these recipes put everyday smart eating BACK on the table! To ask other readers questions about Hungry Girl Simply 6, please sign up. Reviewing a cookbook is a thoroughly new experience for me. As most of you may know, I’m a thriller girl. Recently contacted by Jordan Hanley at St Martin’s Press, I was offered the opportunity to do just that. Both a bit flattered and anxious to try something completely different, I wholeheartedly agreed to “start cooking!” Here we go! My husband and I split the cooking duties in our home. (Ok fine…truthfully he cooks more than I do!). Lately, we’ve found ourselves in a dining rut, cranking out Reviewing a cookbook is a thoroughly new experience for me. As most of you may know, I’m a thriller girl. My husband and I split the cooking duties in our home. (Ok fine…truthfully he cooks more than I do!). Lately, we’ve found ourselves in a dining rut, cranking out the same few dishes over and over. Lisa Lillien known to all as The Hungry Girl is a rapidly rising star and quite well known! I’ve seen her on Dr. Oz and several other cooking shows on both the Food Network and The Cooking Channel. Must admit, I had never tried one of her dishes before. Her latest cookbook, Hungry Girl - Simply Six just became our favorite go-to cookbook. Let’s start with the pictures themselves. Each dish is accompanied by beautifully plated photos that will leave you salivating and wanting to devour it! As advertised, every recipe is only six ingredients. Are you kidding? Fantastic. And perhaps just as amazing? Every single recipe we’ve tried (so far) has been a winner. Also accompanied by amazing tips along the way. My husband and I discovered that these recipes act as a great foundation to stand on their own. Allowing us to put on our junior chefs’ hat and experiment with adding something here and there to suit your own tastes. You’re given the calorie count and all nutritional information as well as your prep and cook times. All recipes are under 375 calories! All are amazing! Bon–appetite!! EZ BBQ Chicken Quesadilla - our only change was we grilled the chicken breast. Tropical fish tacos - we added a table spoon of dressing to the coleslaw mix. Scott’s Nutty Avacado Salmon - yum!! Actually making this one again tonight! There are countless post-it’s marking the pages of recipes we still want to try! This book never makes it into my pantry. It is a permanent fixture on my kitchen counter! Thank you so much to Jordan Hanley at St Martin’s Press and Lisa Lillien for my copy to read, review and continue to use on a daily basis! Kaceey Jaline wrote: "Delicious review, Kaceey! 😊"
I found a lot of neat recipes to copy, that work extremely well with my Weight Watchers, including Chocolate Chip cookies! She provides substitutes - oatmeal instead of flour, etc. that I would have never thought of. I also love the fact that she includes nutritional information, which makes each recipe extremely easy to enter into my WW app. I love that Author, Lillien provided some great tips, as well, including ways to "spice" your food, besides reaching for the salt shaker. Nice book! This is a lot more than a basic book of recipes. Lillien includes many tips and techniques using some of the most popular methods: Instant Pot, sheet pans, and more. She offers a LOT of practical tips to make cooking easier. Instead of just encouraging readers to make a recipe, she helps prepare readers to take control of their own food preparation. I love that she also provide WW Freestyle points for the recipes on her website. I am very happy that I purchased this book! I love Lillien's books - her tone is great, like talking to a friend who's obsesses with food AND with dieting. These recipes are quick and generally include ingredients you probably have around the house. In some cases, I found them to be almost too streamlined - I thought the chicken chili could use a little more depth. But overall, if you want to get a healthy meal together in 30 minutes or less, this is your go-to. Some of the meat and chicken recipes are variations from other books (like Hu I love Lillien's books - her tone is great, like talking to a friend who's obsesses with food AND with dieting. These recipes are quick and generally include ingredients you probably have around the house. In some cases, I found them to be almost too streamlined - I thought the chicken chili could use a little more depth. But overall, if you want to get a healthy meal together in 30 minutes or less, this is your go-to. Some of the meat and chicken recipes are variations from other books (like Hungry Girlfredo) - I thought her Big Book had more to offer for those proteins. This book really shines in the breakfast chapters - her oats and egg recipes are super. A lot of the portions here are for one or two people, but you could easily double for a family. She still uses artificial sweetener (I realize there are natural sources for zero calorie sweeteners, but I dont' trust them), but otherwise the recipes include non-diet 'regular' food. The book has full nutrition info for everything. There were so many good ideas and pictures that deserved 4 stars. The type of book this is I don’t know if I agree with. Sweetener substitute and the like, I am more of the natural route, so with that being said I did find recipes that I would make. This book is worth a look see. This is a cookbook I borrowed from the library, but would like to own. It's simple, pretty and doable. This is how I like to eat! I like that the recipes include the calories per serving. If you are looking for healthy and quick to make dishes, this book is for you! I found a couple of recipes to try. The creator of HungryGirl.com shares her best tips, recipes, and advice to live a healthy and full life!" Lisa Lillien is not a nutritionist, she's just hungry. She's the founder of Hungry Girl, the website and daily email service providing approximately one million fans with guilt-free recipes, food and product reviews, dieting news, shockers and more. She also writes weekly columns for WeightWatc The creator of HungryGirl.com shares her best tips, recipes, and advice to live a healthy and full life!" Lisa Lillien is not a nutritionist, she's just hungry. She's the founder of Hungry Girl, the website and daily email service providing approximately one million fans with guilt-free recipes, food and product reviews, dieting news, shockers and more. She also writes weekly columns for WeightWatchers.com and Yahoo!, and regularly contributes to Redbook magazine. She has appeared on TV shows like Rachel Ray and Extra, and now has her own show on the Cooking Channel. Her Hungry Girl cookbooks are New York Times bestsellers. She lives in Los Angeles, California.